Olivine basalt collected by Apollo 15. Having a mean density of 3,346.4 kg/m³, the Moon is a differentiated body, being composed of a geochemically distinct crust, mantle, and core. This structure is believed to have resulted from the fractional crystallization of a magma ocean shortly after its formation about 4.5 billion years ago. The energy required to melt the outer portion of the Moon is commonly attributed to a giant impact event that is postulated to have formed the Earth-Moon system, and the subsequent reaccretion of material in Earth orbit. Crystallization of this magma ocean would have given rise to a mafic mantle and a plagioclase-rich crust. Geochemical mapping from orbit implies that the crust of the Moon is largely anorthositic in composition, consistent with the magma ocean hypothesis. In terms of elements, the lunar crust is composed primarily of oxygen, silicon, magnesium, iron, calcium, and aluminium, but important minor and trace elements such as titanium, uranium, thorium, potassium, and hydrogen are present as well. Based on geophysical techniques, the crust is estimated to be on average about 50 km thick. 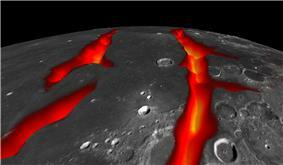 Partial melting within the mantle of the Moon gave rise to the eruption of mare basalts on the lunar surface. Analyses of these basalts indicate that the mantle is composed predominantly of the minerals olivine, orthopyroxene and clinopyroxene, and that the lunar mantle is more iron rich than that of the Earth. Some lunar basalts contain high abundances of titanium (present in the mineral ilmenite), suggesting that the mantle is highly heterogeneous in composition. 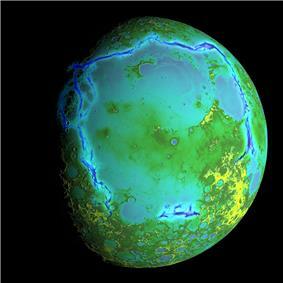 Moonquakes have been found to occur deep within the mantle of the Moon about 1,000 km below the surface. These occur with monthly periodicities and are related to tidal stresses caused by the eccentric orbit of the Moon about the Earth. A few shallow moonquakes with hypocenters located about 100 km below the surface have also been detected, but these occur more infrequently and appear to be unrelated to the lunar tides. 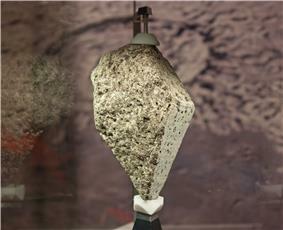 Several lines of evidence imply that the lunar core is small, with a radius of about 350 km or less. The size of the lunar core is only about 20% the size of the Moon itself, in contrast to about 50% as is the case for most other terrestrial bodies. The composition of the lunar core is not well constrained, but most believe that it is composed of metallic iron alloyed with a small amount of sulfur and nickel. 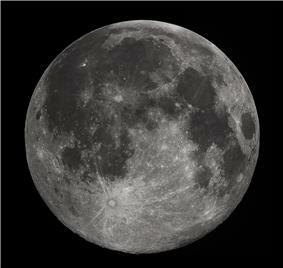 Analyses of the Moon's time-variable rotation indicate that the core is at least partly molten. In 2010 reanalysis of the old Apollo seismic data on the deep moonquakes using modern processing methods confirmed that the Moon has an iron rich core with the radius of 330 ± 20 km. The same reanalysis established that the solid inner core made of pure iron has the radius of 240 ± 10 km. The core is surrounded by the partially (10 to 30%) melted layer of the lower mantle with the radius of 480 ± 20 km (thickness ~150 km). These results imply that 40% of the core by volume has solidified. The density of the liquid outer core is about 5 g/cm3 and it can contain as much 6% sulfur by weight. The temperature in the core is probably about 1600–1700 K.
^ P. Lucey and 12 coauthors, P. (2006). "Understanding the lunar surface and space-Moon interactions". Reviews in Mineralogy and Geochemistry 60: 83–219. ^ a b c Mark Wieczorek and 15 coauthors, M. A. (2006). "The constitution and structure of the lunar interior". Reviews in Mineralogy and Geochemistry 60: 221–364. ^ J. G. Williams, S. G. Turyshev, D. H. Boggs, J. T. Ratcliff (2006). "Lunar laser ranging science: Gravitational physics and lunar interior and geodesy". Advances in Space Research 37 (1): 67–71. ^ Weber, R. C.; Lin, P.-Y. ; Garnero, E. J.; Williams, Q.; Lognonne, P. (2011). "Seismic Detection of the Lunar Core". Science 331 (6015): 309–312.